It took a little bit for me to settle into this book perhaps because I’m used to reading American style English and the flow is different since this book is centered in India with some side jaunts to Hong Kong and Australia. All of whom I’ve discovered have their own style of English while reading Black Tiger. Once I got into the flow however I found this to be a captivating book to the end and beyond. Greta has woven together a number of threads quite well in a short space. Though the important plot lines were resolved the story could certainly continue and I have grown attached to Ash and Sally – I would like to see more of them in the future. I hope this isn’t goodbye. Plus the tigers still need more help to continue their threatened existence as the free roaming wild creatures they were intended to be. Greta has also managed to create a book that involves fantasy, paranormal, romance, action, adventure, even a smidge of science thrown in. There’s something for everyone here if you take the time to look. Yes even guys I think would find something to enjoy here though this has more elements to appeal to the female crowd. And the best thing is all profits from this book go to the David Shepherd Wildlife Foundation to help protect the Tigers. Visit other tour participants through links posted on the schedule at BWR Tours’ Site – the organizers of this tour. 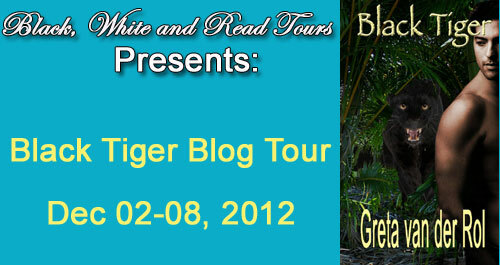 Thanks to the author for a review copy in conjunction with the Black, White, and Read Blog Tour. Use the Rafflecopter below for your chance to win one of two ebook copies of Black Tiger that Greta is donating this is the last day to enter. Thanks for the kind words, Melissa. I\’m glad you enjoyed the book.